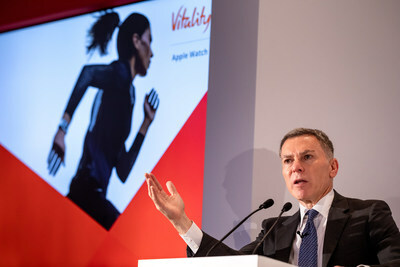 Incentives and Physical Activity, conducted by leading independent research institute, RAND Europe, found an average 34% increase in activity levels of participants using Vitality Active Rewards with Apple Watch. The study examined the behaviours of over 400 000 people in the UK, US and South Africa. A sustained increase in activity of 4.8 extra days a month, which Vitality estimates translates into two extra years of life. Activity increased across all participants, regardless of location, health status, age or gender. 'At-risk' participants with a high body mass index (BMI) showed greater improvements than others, with increases in activity of 200% in the US, 160% in the UK, and 109% in South Africa. With these sustained increases in activity, Vitality estimates that within a year, participants achieved numerous benefits, such as improvements in blood pressure, cholesterol, and cardiorespiratory fitness, as well as lowered healthcare costs. Access more information on the study and the global Vitality network here.